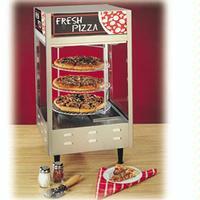 Powerful, attractive NEMCO Merchandisers stimulate added sales of your fresh pizza, pretzels, bagels, muffins, etc. Choose from either 3 or 4 tiered rack models ideal for holding and displaying your product in a controlled temperature environment. Both single and double door units are available with fixed or rotating shelves. Durable stainless steel construction and tempered glass makes clean-up quick and easy. All units come with lighted interiors, contemporary signage, and a water reservoir to provide humidity. Merchandisers shall be constructed with a brushed stainless steel frame and tempered glass sidewall panels. The interior shall have a water reservoir for maintaining moisture. All units will have case vents, contemporary, stylish signage, 4 inch legs, 2-40W oven lamps, and a 69 cord and NEMA 5-15P plug. Each unit shall have a 1400W tubular heating element, separate rocker switches for the interior lights and heating element, light indicating cycling of heating, and a bulb and capillary adjustable thermostat. The units shall operate on 120 volts and be rated at 1480 watts. The merchandisers shall carry the approval of ETL Testing Laboratories and shall be listed with the National Sanitation Foundation.